LATHAM -- Iona K. Seefeldt-Gilman, 83, of Latham died Monday, May 30, 2005, at 10:55 p.m. at Decatur Memorial Hospital, Decatur. Visitation will be from 4 to 7 p.m. Thursday at Fricke-Calvert-Schrader Funeral Home in Mount Pulaski. Her funeral will be at 11 a.m. Friday at Fricke-Calvert-Schrader in Mount Pulaski. She farmed in the Latham area with her husband. She was born Aug. 20, 1921, in Latham to Frederick and Moneta Jarvis Kiick. She married Robert Bree Seefeldt in Latham on Oct. 10, 1940. He died Nov. 5, 1989. She married Richard Gilman in Warrensburg on Nov. 8, 1994. He survives. Other survivors are one son, James R. (and Karen) Seefeldt of Decatur; one daughter, Anita J. (and Gary) Gillett of Decatur; three grandchildren, Melinda Berger of Washington, D.C., Dr. Sean (and Lee Ann) McCain of Carbondale and Jason McCain of Urbana; 27 stepgrandchildren; two great-grandchildren, Madison James McCain and Aidan Bree McCain, both of Carbondale; and 10 step-great-grandchildren. She was a member of the Illini Congregational United Church of Christ and its Women's Fellowship, Stephen Decatur Chapter Daughters of the American Revolution and Ladies Landowners. She was the fifth descendant in her family since 1830 who lived in Latham. Memorials may be made to Latham Fire and Rescue or the Illini Congregational Church of Christ. Click here to send a note of condolence to the family of Iona Seefeldt-Gilman. 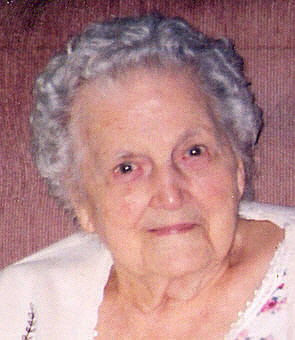 LINCOLN -- Minnie Funk, 97, of Lincoln died Sunday, May 29, 2005, at 1 p.m. at St. Clara's Manor. Her funeral will be at 1 p.m. Wednesday at Fricke-Calvert-Schrader Funeral Home in Lincoln, with the Rev. R. Anthony Lee officiating. Visitation will be from 11:30 a.m. to 1 p.m.
Mrs. Funk was a homemaker. She was born March 26, 1908, in Lincoln to John and Hermina Spedka Kodatt. She married Donald O. Funk in Lincoln on Nov. 18, 1935. He preceded her in death. She is survived by two daughters, Jeanette Behrends of Lincoln and Marian "Mickey" (and Carl) Hobbs of Emden; eight grandchildren; 11 great-grandchildren; and two great-great-grandchildren. She was also preceded in death by four brothers, five sisters and one son. She was a member of Holy Family Church in Lincoln. Click here to send a note of condolence to the family of Minnie Funk. LINCOLN -- Bernadine M. Funk, 88, of Lincoln died Sunday, May 29, 2005, at 1:40 a.m. at the Christian Nursing Home. There is no visitation, and private family services will be at a later date. Fricke-Calvert-Schrader Funeral Home in Lincoln handled arrangements. She was born March 22, 1917, in Peoria to Joe and Hazel Baker Maston. She married William Lee Funk, and he preceded her in death. She is survived by two sons, Alva Funk of Pendleton, Ore., and William Lee Funk of Mathina, Ore.; one daughter, Barbara Petri of Lincoln; and seven grandchildren. She was also preceded in death by seven brothers and sisters and was the last of her immediate family. Click here to send a note of condolence to the family of Bernadine Funk. SHERMAN -- Carl Gustaf Henry Ebbersten, 71, of Sherman, formerly of Elkhart, died at home at 3:15 p.m. Saturday, May 28, 2005, after a long illness. Visitation will be from 3 to 8 p.m. Wednesday at Fricke-Calvert-Schrader Funeral Home in Mount Pulaski. His funeral will be at 10 a.m. Thursday at Fricke-Calvert-Schrader in Mount Pulaski, with Allen Hickerson officiating. Burial will be in Elkhart Cemetery, Elkhart. Mr. Ebbersten was a retired farmer. He was born July 20, 1933, in Lincoln to Walter G. and Ellen Marie Johnson Ebbersten. He married Shirley Cravens in Cornland on March 2, 1957, and she died May 20, 1992. He married Jean Gilbert in Eureka Springs, Ark., on Dec. 6, 1996. She survives. Other survivors are one son, Darrell (and Lorene) Ebbersten of Elkhart; one daughter, Charlene (and Jerry) Bedolli of Elkhart; one stepdaughter, Gayle (and Mark) Murray of Springfield; one stepson, Patrick (and Debbie) Gilbert of Springfield; two grandchildren, Andrew Bedolli and Erin Bedolli of Elkhart; and four stepgrandchildren; Justin and J.P. Murray and Rachel and Taylor Gilbert, all of Springfield. He was also preceded in death by one sister, Martha Dodd, and one stepson, Craig Gilbert. He was a member of the First United Methodist Church, American Legion Post 616, Sangamon County Farm Bureau and the I & I Antique Tractor and Gas Engine Club. He served on the Cornland and Elkhart school boards. He collected antique tractors and farm equipment. Memorials may be made to St. Jude's Children's Hospital or Cornland Christian Church. Click here to send a note of condolence to the Ebbersten family. MOUNT PULASKI -- Wilbur W. Lucas, 91, of Mount Pulaski, formerly of Lanesville, died Friday, May 27, 2005, at 3 p.m. at Abraham Lincoln Memorial Hospital in Lincoln. His funeral will be at 10 a.m. Wednesday at Fricke-Calvert-Schrader in Mount Pulaski, with Bill Shanle officiating. Burial will be in Roselawn Cemetery, Springfield. Mr. Lucas was a lifelong farmer in Lanesville. He was born April 29, 1914, in Logan County to Andy and Bessie Cox Lucas. He married Naomi Febus in Springfield on Aug. 12, 1936. She died March 29, 1999. He is survived by two sons, Robert (and Jean) Lucas of Mount Pulaski, Richard (and Peggy) Lucas of Buffalo; six grandchildren; nine great-grandchildren; one brother, Eugene (and Ruth) Lucas of Elkhart; and one sister, Wilma Febus of Mount Pulaski. He was also preceded in death by two sisters, one brother and one son, David. He was a member of the Illiopolis United Methodist Church. Memorials may be made to the American Cancer Society or Buffalo Christian Church. Click here to send a note of condolence to the Lucas family. MANITO -- Lonnie "Lon" Richard Allen, 54, of Manito died Thursday, May 26, 2005, at 12:38 a.m. at Pekin Hospital, Pekin. Visitation will be from 5 to 7 p.m. Tuesday at Hurley Funeral Home in Mason City. A service will follow at 7 p.m., with the Rev. Robert Paddack officiating. Mr. Allen was a machinist at Caterpillar in East Peoria. He retired in 2001 after 31½ years with the company. He served in the National Guard from 1970-1974. He was born Dec. 27, 1950, in Springfield to Richard E. and Shirley Jean Davis Allen. He married Linda Charles on Oct. 28, 1978, in Lincoln. He is survived by his wife, in Manito; one sister, Bonnie (and Dave) Knieriem of Mason City; and two nephews, Scott Anthony Starr (and daughter Heaven) of Mason City and Kent Allen Starr of Mason City. He was a member of the First Christian Church of Mason City, UAW Local 974, NRA, ABATE, Antique Motorcycle Association of America and Greenpeace. He was an avid Harley rider and enjoyed target shooting. Memorial contributions may be made to a memorial fund in his name through CEFCU, 3515 Court St., Pekin.